A 32 hectare family estate, this traditional vineyard is located at Soturac on the terraces of the Lot valley at the extreme western edge of the Cahors appellation. This location, with a micro-climate influenced by the Atlantic, contributes to the early maturation of the grapes and consequently ensures the regularity of the vintages. Deep roots mean the vines can withstand scorching summer heat and draw vital minerals that are essential for the concentration and the complexity of the grands vins. As defender of the agro-environmental ethic Alain Gayraud gives high importance to soil work (the terroir is 60% clay-limestone and 20% each clay-siliceous and limestone) ensuring a natural balance of micro-organic activity. Fertilizers are banned and treatments are kept to an absolute minimum. The estate, originating from Gallo-Romaine era, was partly destroyed during the Middle-Ages but managed to survive until Phylloxera attacked in 1878. Some Auxerrois plants were nonetheless conserved by Edouard Serougne who during the 1920s fell in love with the estate owner and with this grape variety. He encouraged his contemporaries and was one of fifteen estate owners who revived the Confrerie des Vins de Cahors. Today, Alain Gayraud is a dedicated wine-maker producing relatively small quantities (200,000 bottles) of world-class wine. Whilst Auxerrois (aka Cot or Malbec) is the mainstay, providing 100% of the superb top cuvée "Expression", it is blended with small quantities of Tannat or Merlot in the other wines. 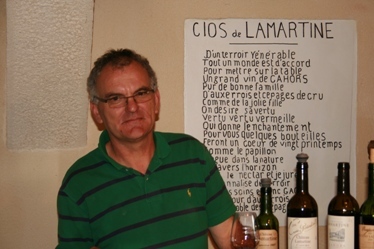 Alain makes his wines to drink well young but, equally, these are wines with good futures ahead. 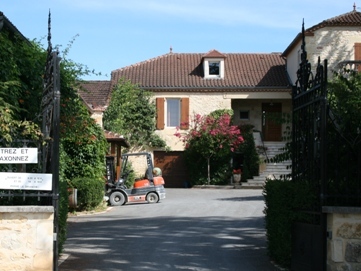 This family-run estate is where winemaker Alain Gayraud was born and continues to live and work. The Lamartine estate was built over a former oak forest and according to legend is the place where Martine, a local girl, used to rendez-vous with her lovers.